Construction workers building a relief road around Weymouth, the site of the 2012 Olympics sailing event, made a grisly discovery in June, 2009. 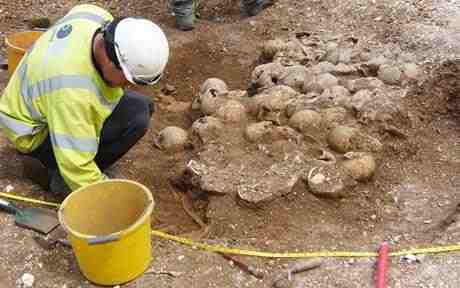 While removing a hedge on Ridgeway Hill, they uncovered a mass grave of decapitated skeletons thrown together haphazardly with the skulls stacked to one side. The pit, the site of an ancient Roman quarry, contained the remains of 51 tall and robust young warriors in their late teens and early twenties with a few in their thirties. 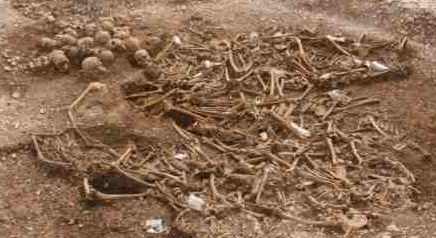 Scientists used radiocarbon dating to place their deaths between AD 910 and 1030. Based on an analysis of the isotopes in the teeth of 10 of the bodies, scientists identified Scandinavia as the probable Viking war band’s home. The Dorset hilltop which lies beside the ancient main road from Dorchester to Weymouth is typical of execution sites – a prominent location, near a main road and a parish boundary. The absence of pins or toggles with the bodies suggests that the men were publicly executed and their clothing taken. Since there are more bodies than heads, the missing heads may have been mounted on posts as a warning or taken as souvenirs. Since the bodies show few signs of other trauma, the men were alive when their heads were hacked off with swords or axes. Many of the executed suffered multiple deep cuts to the skull, jaw, and upper spine, as well as the neck. Not easy deaths, especially for Viking warriors. Execution denied them the warriors’ deaths which would have gained them entry to Valhalla, the warrior’s heaven.